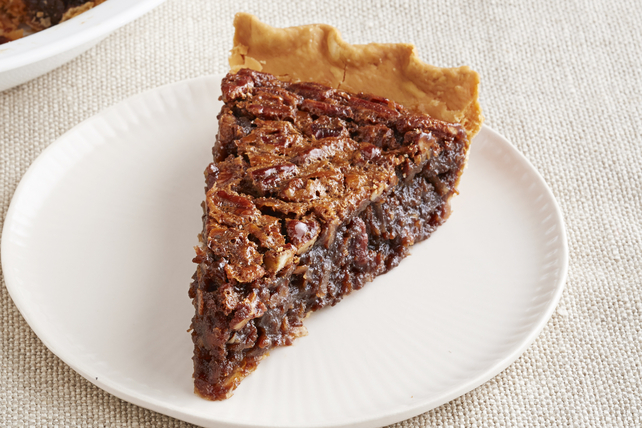 Traditional pecan pie is enriched by adding chocolate and coconut to the filling. Microwave sugar and corn syrup in large microwaveable bowl on HIGH 3 min. or until mixture comes to boil. Add margarine and chocolate; stir until chocolate is completely melted and mixture is well blended. Cool slightly. Heat oven to 350°F. Line 9-inch pie plate with pie crust as directed on package. Add eggs, 1 at a time, to chocolate mixture, beating well after each addition. Stir in coconut and nuts. Pour into crust. Bake 50 to 55 min. or until filling is set in centre. Cool completely. Prepare using dark corn syrup.